Rudiments VI can be seen as the third four weeks of our Basics II Series. 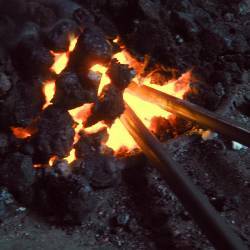 Gift Certificates for Rudiments of Blacksmithing VI are available. If you're interested in taking Rudiments of Blacksmithing VI and it's not on the calendar, please tell us using our Waiting-List Page.